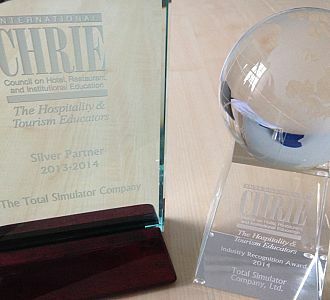 At the 2014 ICHRIE (International Council on Hotel, Restaurant & Institutional Education) Awards Ceremony in San Diego, The Total Simulator Company (TSC) was presented with the prestigious Industry Recognition Award. TSC produce industry leading simulation programs for the hospitality, restaurant and tourism industries. These simulations are licensed for educational use and also used to deliver industry training and events. TSC have developed the industry leading, HOTS hotel simulation program, which is used to teach hospitality students and industry professionals about hotel operations, revenue management, marketing, finance & strategy. TSC has been a long-time supporter of CHRIE worldwide and is one of the few UK based business to regularly attend the annual conference in the US. When collecting the award, Mike James (Company Director) said, “This is a great honour for us to be recognised in this way, especially in the year of our Silver Anniversary”. During the last 25 years of developing business simulations the company has experienced great changes in technology, which has required continued investment in HOTS. This has seen the highly regarded hotel simulation grow to a sophisticated, online, fully interactive business simulation, which is used by a vast number of global hotel schools, colleges and hotel corporations. Recent collaboration with STR Global has seen the introduction of benchmark reports into the simulation. This delivers an opportunity for learning and development on the power of benchmarking for both students and industry professionals. TSC have worked closely with STR Global to make this happen, which is a great example of the added value they deliver to their global client base. This, along with all other features, provides early ‘real-life’ experience, which is helping students gain employment once they complete their studies. TSC continues to support their educational clients by delivering train the trainer events prior to all CHRIE conferences in the US, Europe and Asia-Pacific regions. Next month sees the launch of the 2015 Passion 4 Hospitality Business Management Game, which is organised by the Institute of Hospitality in partnership with TSC, arena4finance and HOSPA. Now in its second year, this event brings teams of university students together to compete using HOTS. Students are presented with a scenario and tasked with beating their fellow student competition. Application details are due to be released in September for this event, with further details appearing on the TSC website. New developments are constantly being made to the simulation in order to keep pace with the global hospitality industry. At the ICHRIE conference this year, TSC also launched a new simulation program, RTS – The Restaurant Simulation. This simulation program has a focus on teaching profitable restaurant operations and menu engineering. This is now available for both educational and industry use, with further information on their website – www.thetotalsimulator.com. Operations Manager for TSC, Peter Russell, said “We are delighted to have received this award and we look forward to continuing our relationship with the CHRIE organisation over many years to come. Thank you and here’s to the next 25 years”. arena4finance would like to congratulate The Total Simulator Company on receiving this prestigious award and we look forward to working with TSC into the future and imminently at Passion 4 Hospitality 2015. For further information regarding Passion 4 Hospitality 2015 and how you can become involved, please contact Wayne Gosden.